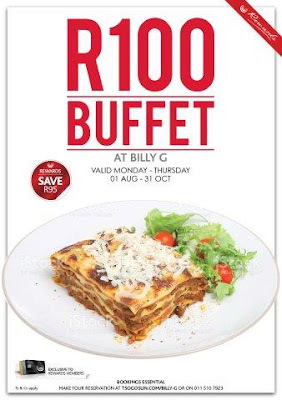 Billy G, the upmarket, family-friendly buffet restaurant at Montecasino, is offering its renowned and extensive buffet at a huge discount of almost 50% off. The R100 buffet promotion runs from Monday to Thursday, right up to 31 October for Rewards cardholders. With a wide selection of dishes that include hot and cold starters, main courses and desserts, there’s no better way to spend R100. From succulent cuts of meat at the carvery, to a variety of casseroles, curries and vegetarian offerings, seafood, pasta dishes, salads and tantalising desserts, there’s something to suit every palate. Although only available to cardholders, any guest can sign up for free to the Rewards programme and take advantage of this excellent offer as well as other Rewards benefits. For more information go to www.montecasino.co.za, join on Facebook at www.facebook.com/montecasino or follow on Twitter at @MontecasinoZA. To book, visit www.tsogosun.com/billy-g or call 011 510 7923.